Have you ever needed someone to access one of your accounts but you weren’t there to give them the login and password? This happens to all of us, whether it’s in the work place or with friends and family. 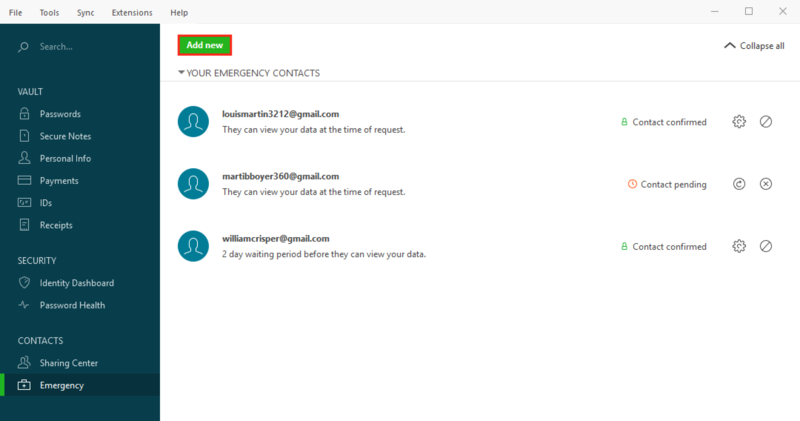 The Emergency feature in Dashlane lets you manage these urgent situations while giving you control over all your data. The emergency contact feature is currently unavailable on Android and iOS. To use the feature you must do so through our desktop application. We apologize for the inconvenience. We intend to bring the feature back to Android and iOS in the future, along with other improvements to your mobile experience. On a desktop device, click here to download Dashlane. Is it safe and do I need to give my contact my master password? Do I need to be Premium to use the Emergency feature? What if my emergency contact doesn't install Dashlane? In a personal context: if you want to make sure that your friends or family can access your important data (passwords or notes) in an emergency or in case something happens to you. In a professional context: if you go on vacation, you can give colleagues access to some of your data, or let them ask you for access in case they need it. This would also be useful if you were unable to go to work for some reason, maybe illness, and your colleagues needed access to your accounts. Also, you might be worried that you’re going to forget your master password and so you want to give access to someone else in case this happens. Your data is completely secure with this new feature. You do not need to give anyone your Master Password. A unique public key (which is used to encrypt data before sending it to other users) saved on Dashlane's servers. A unique private key (known only to you and never shared or transmitted to others) which is directly saved in your Dashlane account and encrypted in your Dashlane settings so this works even for free users who do not have the sync feature because your account settings are synced across all devices, even if you don't have Premium. This private key is used to decrypt data exclusively. Please note that your private key is different to your master password. Your private key is encrypted with your master password and stored in your settings in your Dashlane account (along with all your other sensitive data). This private key is synced over to other devices in the same way as your encrypted data is. Please note that we never send your master password over the internet. Both keys are generated together and are meant to work together because they only work in one direction. One can never be used to replace the other. You could give your public key to all the impalas on Earth and no one could ever use it to decrypt and read your shared data. This is public-key cryptography magic! The data that is shared is encrypted with the user’s public key but cannot be decrypted with the public key. The data can only be decrypted with the private key of the user (which is only known to the user) but the private key cannot be used to encrypt data. 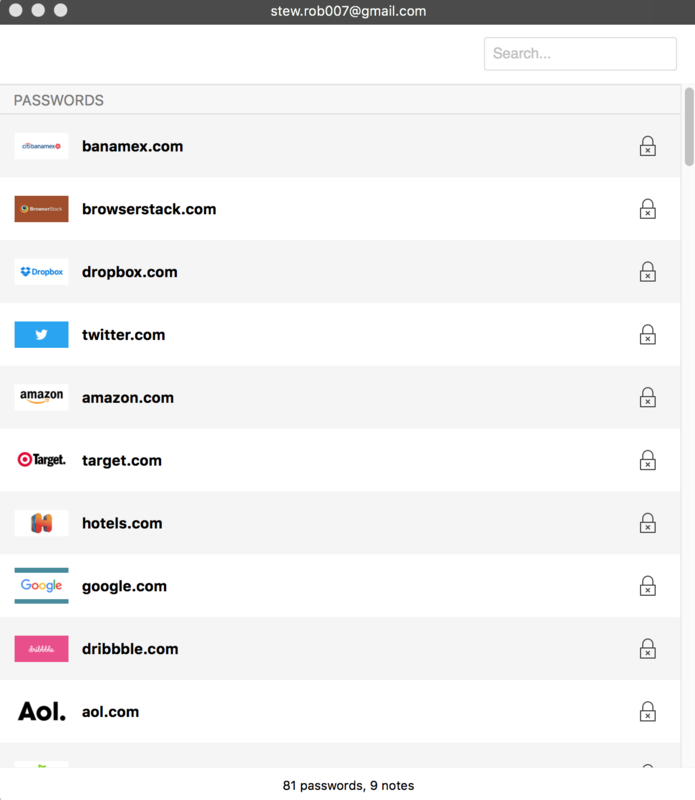 The Emergency feature lets another Dashlane user access the data you store in Dashlane. Choose your emergency contact. 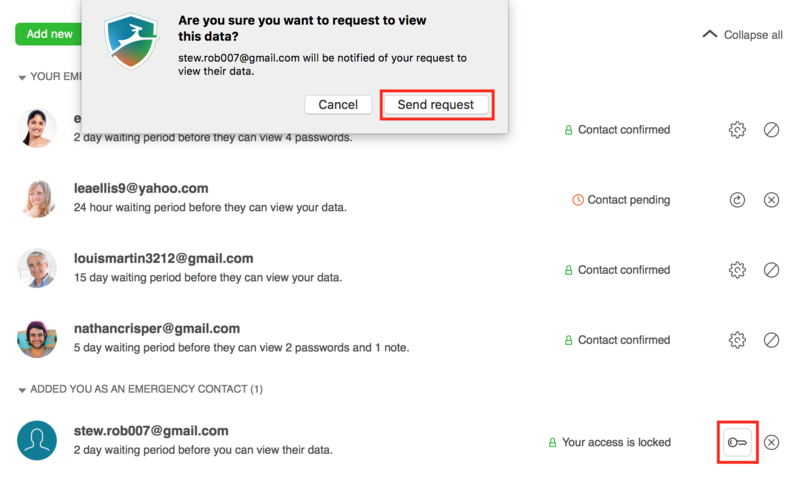 When the set-up process is complete, this contact will be able to request access to your data and when they do, you will get an email asking if you want to grant or decline access. Note that the following screenshots are for the Windows desktop app, but the process is the same on your Mac. Set a waiting period: this is how long you will have to either grant or decline an access request. If you do not refuse the access within that period, it will be automatically granted. The period can be set at 0 to 3 months and the default is 2 days. For example, you can set a period of one month. If your emergency contact asks for access to your data and you do not reply within this month, they will have access to your data. Please note that you can also set the waiting period to "Require your response", in which case access will never be granted unless you accept the request. After confirming, your emergency contact invitation will be sent to the address email specified in the field. The invitation will appear as pending in your Dashlane app until accepted by your contact. Your contact will receive a message both in-app and by email, as shown below. After your contact has accepted to become your emergency contact, they will be able, at any time, to ask you for access to your data. To do so, they will need to go to the Emergency section of their Dashlane app, and click on the key next to your email address. After that, you will receive an email and an in-app pop-up message alerting you that your emergency contact has requested access to your data. You will be able to grant or decline the request from the pop-up or from the Emergency section. If you decide to grant access, here is how the Emergency section will appear on your contact's side. By clicking the magnifying glass icon, they will be able to view the data you previously allowed them to view in this circumstance. By simply clicking the black lock icon next to a credential, your login and password will appear. Once emergency access has been activated, if you add any Password or Secure Note to your account, your emergency contact will have access to this new data. This is not the case for Receipts, Payment data, Personal Info or IDs, or if you have chosen to give your emergency contact limited access to your data. Your emergency contact has read-only access to your data and can't edit or change anything. After your emergency contact has accessed your data, you can still revoke access at any time. If you do this then they will need to ask you for access again. Not all your Dashlane data is shared to your emergency contact. Only passwords and notes are available to them so this does not include anything you store in the Receipts, Payments, Personal Info or IDs sections in Dashlane. Make sure you keep everything you want to share to your emergency contact in the Passwords and Secure Notes sections of the application! If you choose this option, then all your data is sent to your emergency contact. They will have full access to all your secure notes and passwords. If you choose this option, then only some passwords and notes will be available to your emergency contact. The list of data can be edited after it's been enabled so you can add or remove items from your emergency contact. 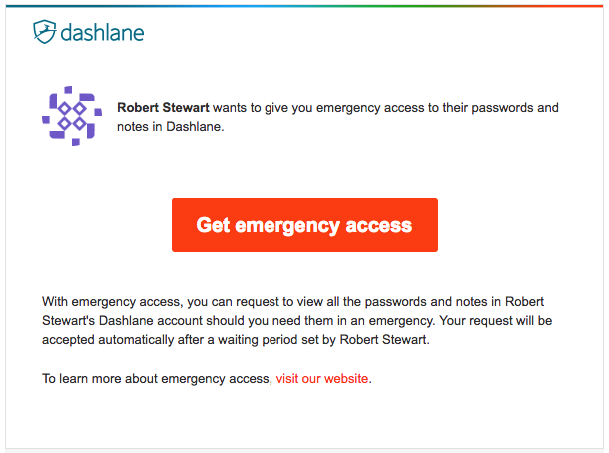 No, anyone with a Dashlane account, free or Premium, can use the Emergency feature. Then they won't have access to your data in case of an emergency. 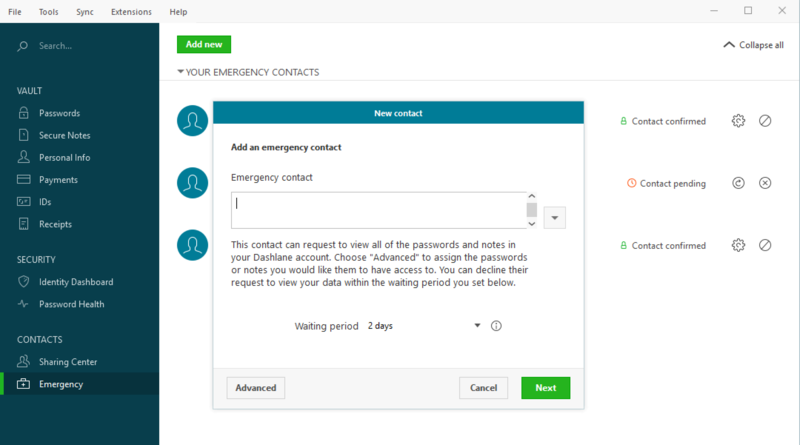 Your emergency contact must also have a Dashlane account for the feature to work. Note that you need to log in to your Dashlane account at least once after your emergency contact has accepted your request before the feature can work. This is necessary for your data to be encrypted with the public key. Only then will your emergency contact be able to decrypt this in their Dashlane account. 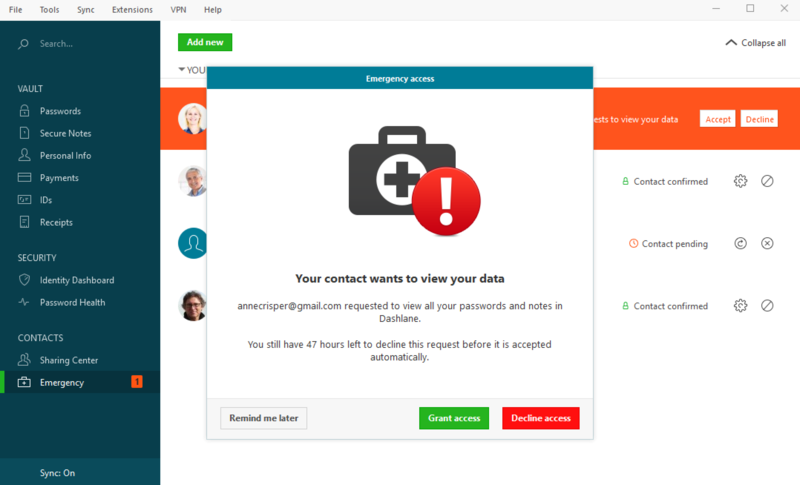 Make sure your emergency contact installs Dashlane and clicks on Accept. You will see a notification in your Dashlane account (and in the Emergency section) once they have done this.